Michigan’s thumb coast is often overlooked, underappreciated and ignored by potential tourists residing in southeast Michigan. Meanwhile generations of families have built or maintained cottages along the St. Clair River and Lake Huron, enjoying the deep blue water, numerous beaches, quaint towns, ice cream shops, restaurants and camping… not to mention the availability of bait on nearly every street corner in town. The thumb has its own unique culture. 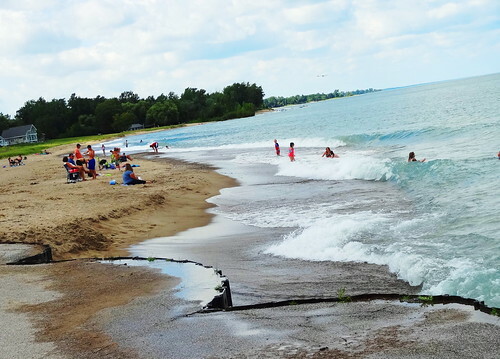 Free Press columnist Rochelle Riley recently gushed to readers about her visit to Marine City; with so much to offer, why don’t more Detroiter’s take advantage of the close proximity of this water-wonderland? Today we’re headed about mid-way up the thumb coast. 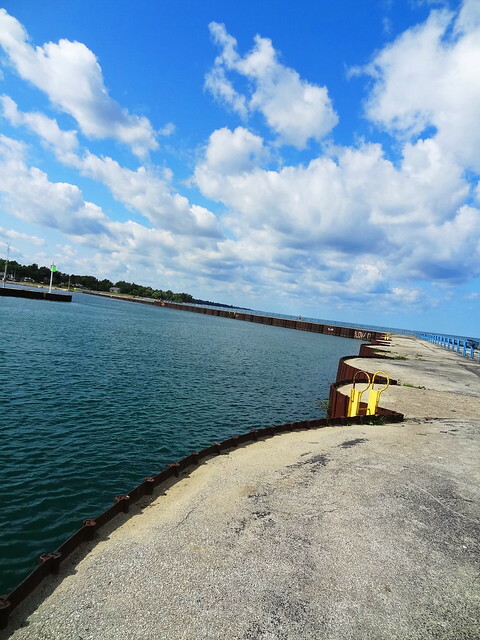 The Village of Port Sanilac sits snugly on the shores of Lake Huron. 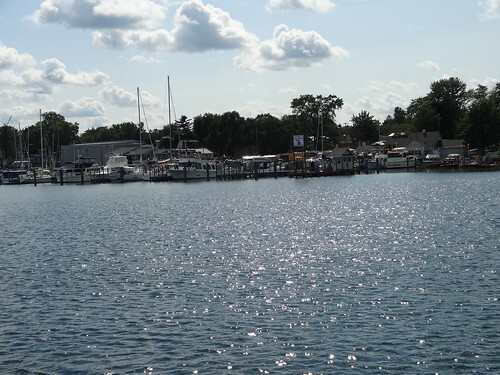 About 90 minutes northeast of downtown Detroit, it was originally a lumberjack settlement; the village is home to restaurants, beaches, marinas, the Port Sanilac Lighthouse (1886) and the oldest, continuously operating hardware store in Michigan, Raymond Hardware (since 1850). 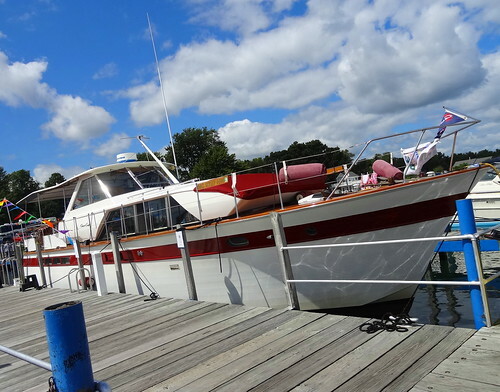 We’re in town for the Antique Boat Show and Vintage Festival. 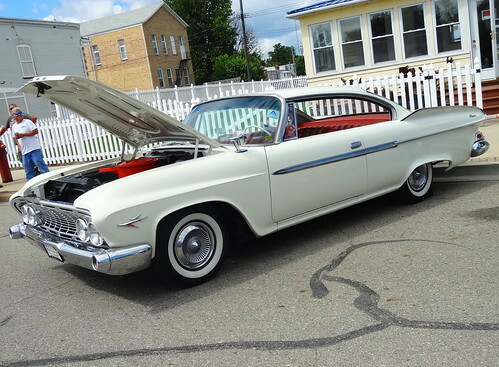 Old cars, boats and trailers fill Main Street, the harbor and the park. A steady stream of sandal-wearing pedestrians gravitate toward the activity; live music is playing in the distance, the aroma of food fills the air. 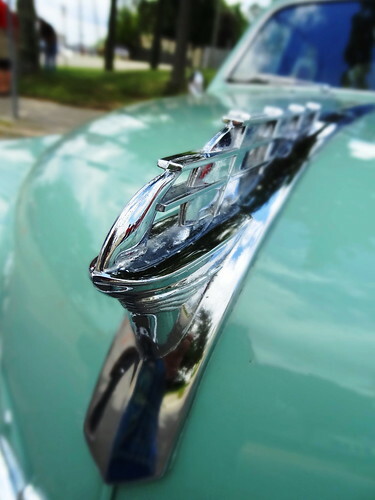 Classic cars are parked on both sides of Main St. 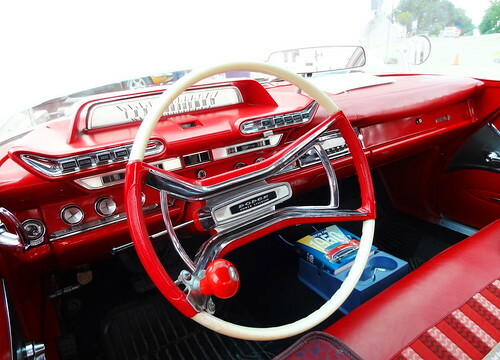 I follow Kris’s lead and walk over to the 1961 Dodge Phoenix, this one is white with a fire engine red interior, lots of chrome, glass and push buttons, great upholstery too. 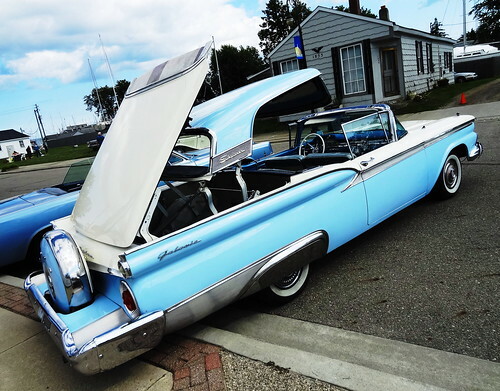 The late 1950’s Galaxie Skyliner has a retractable top, it looks great in powder blue and white. Vehicles span the decades, there’s a beautiful Model A, I like the yellow wire wheels, the 1976 black Trans Am is a limited edition celebrating Pontiac’s 50th Anniversary. 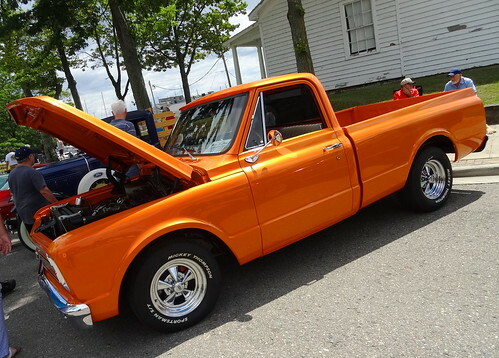 The metallic orange paint on the custom Chevy truck glows in the sunlight, the mid-60’s Ford Ranchero is pretty cool too. 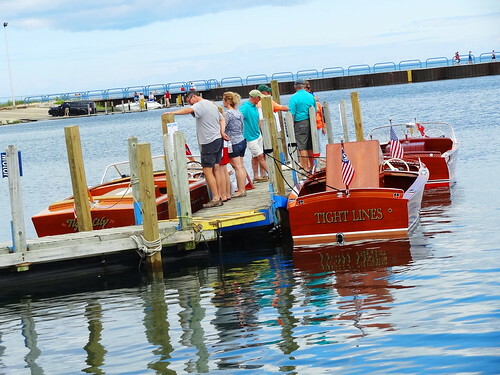 We walk directly down to the water, the lake is gorgeous today, people mill about checking out the antique boats. As usual, I like to read all the names; Chrissy, Alibi, Tight Lines, oh and a boat I think is stunning, Tiger Lily. 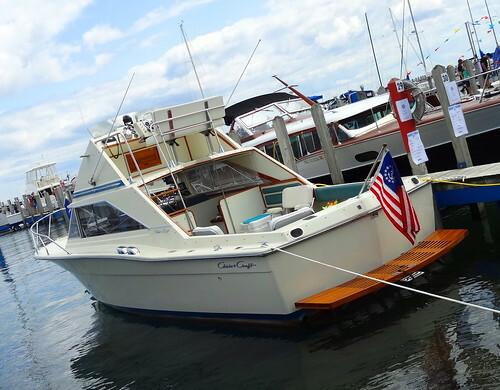 We’ve been to a lot of these antique boat shows, many of the them have become familiar but I never get tired of looking. 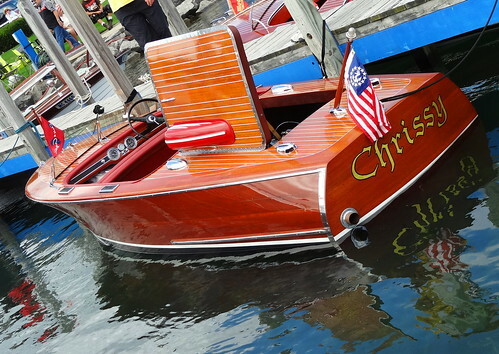 Chris Craft seems to rule the water in this area, all of that lovely wood, simple interiors, they truly are classics. I have lost Kris for the moment, then I see him on a dock, City Slicker has caught his attention. 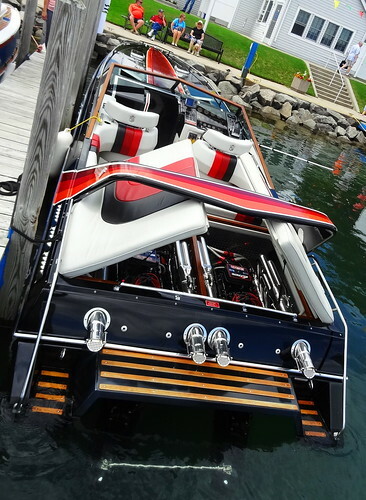 The long, black off-shore is a Stinger by Chris Craft; graphics in shades of red hug the sides, loop the arch and come to a point on the ‘hood’, not to be left out, bold stripes continue across the white upholstery, slick indeed… We pass more wooden beauties, larger cabin boats are further down in the marina, they have a nice turn out today, the weather is perfect too. 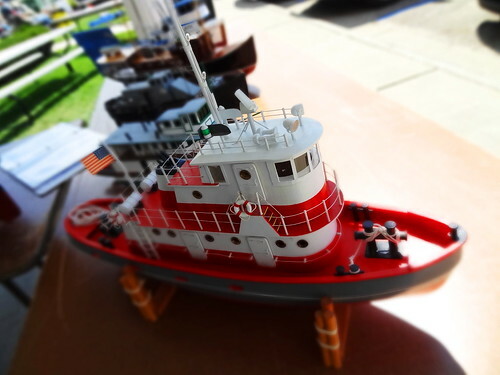 Tables are set up by one of the buildings, model boats are on display; I can’t get over the detail! Replicas of boats from African Queen and Jaws get a lot of attention, I think they’re all pretty amazing. 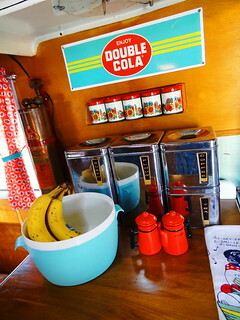 Members of Tin Can Tourists are set up in Harbor Park, not only are the trailers kitschy-cool, the owners let you go inside–I love that. 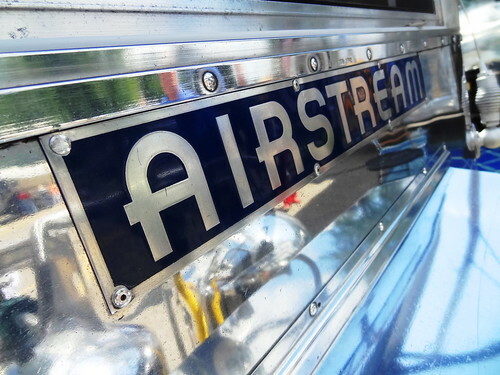 Airstream, Shasta, Trotwood, just a few of the brands present today. 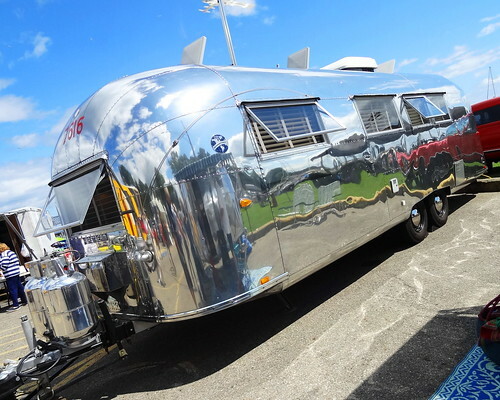 Generally speaking, people who have vintage trailers seem to enjoy all things vintage; bicycles, furnishings, accessories, linens, electronics, they do a great job assembling items and incorporating them into their home-on-wheels. 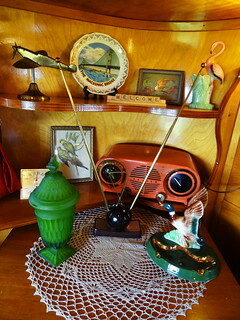 Many of the trailers have beautifully restored wood paneling, along with original features people add modern conveniences and their own personal touch. One of my favorites looks like a family room out of a 1950’s home decorating magazine. 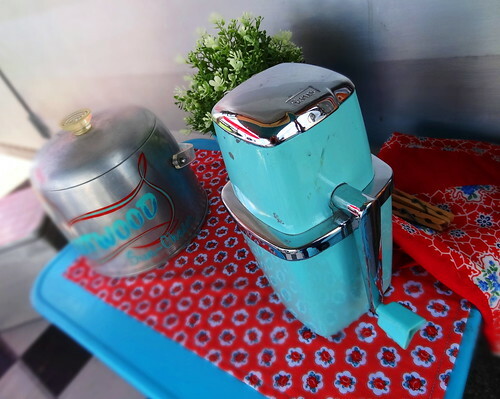 Mid-Century decor is probably the most prevalent. 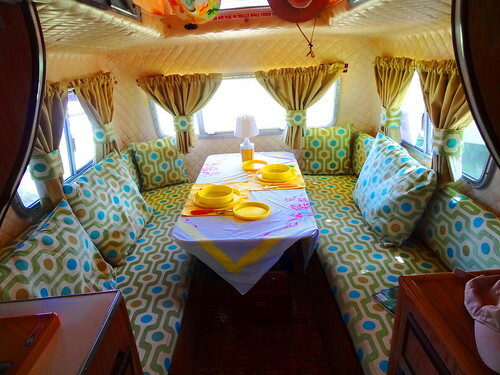 Theme’s are always popular too, the western one with the desert mural or the 70’s style with shag carpet. Here’s something different, a newer motor-home (relatively speaking) with the original interior; dark wood, hammered copper tabletops, back splash and accents, stained glass inserts in the cabinet doors. 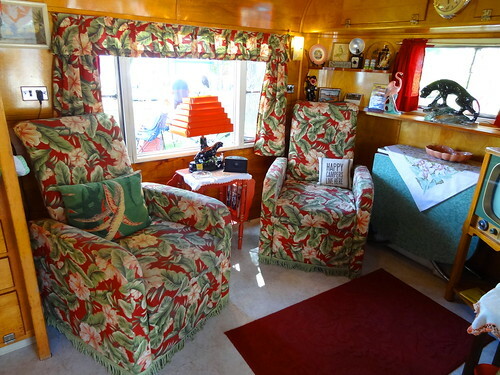 I really like the leaf pattern on the couch and the tropical bedspread. 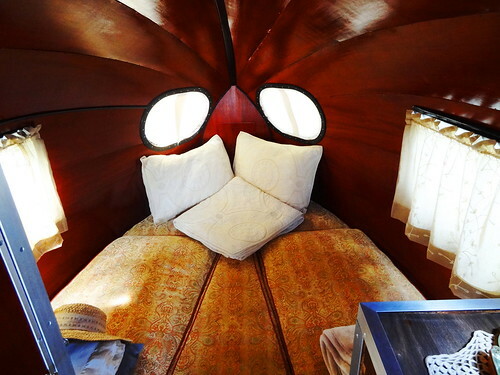 The couple lives in the motor-home full-time, they travel from place to place like the wind. We drive over to The Portly Pig for lunch. 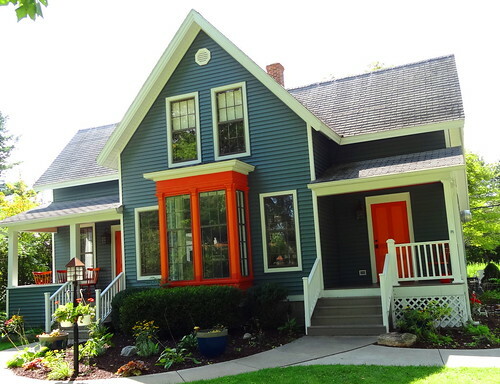 The restaurant is located in a pretty blue house trimmed in white with orange accents. There’s a definite animal theme inside; meat, of course, is the main attraction. 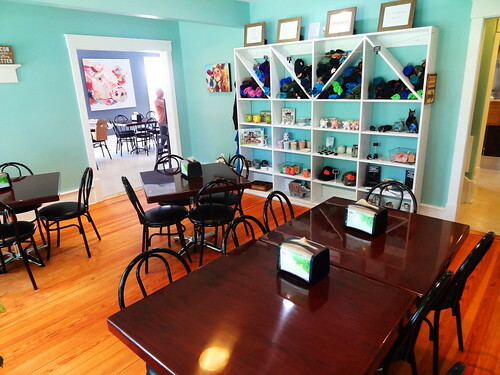 We order at the counter then have a seat near the large front windows, teal-colored walls remind me we’re right off Lake Huron. Large quantities of food arrive, I can’t wait to dig in. 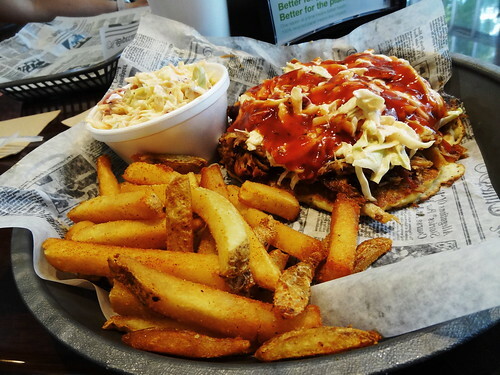 The Pork Stack is a generous heap of flavorful pulled pork resting on an amazing cornbread pancake topped with coleslaw and bbq sauce, every forkful is spectacularly delicious. Sharing table space is a side of fries and coleslaw, both excellent. They have full ice cream service too; cones, cups, malts, sundaes, not possible after the lunch we just had..
At the public beach we park the car and take a walk on the pier, the scalloped edges are unique. 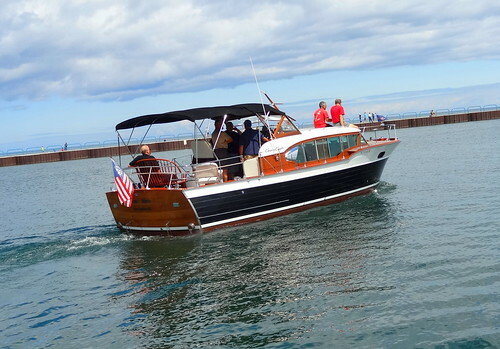 It feels like we’re far out into Lake Huron; we watch sailboats and pleasure boats out for a cruise, wooden boats from the show are out enjoying the lake too. Swimmers, sunbathers and beachcombers are caught up in their surroundings, waves are rolling in, sunlight sparkles off the water, it’s like a picture in tourism brochure. 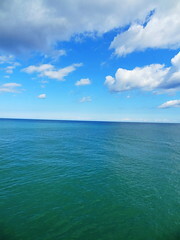 You don’t have to drive all day and spend a lot of money for a trip to be a vacation, in Michigan you just follow the water.